I making dosa with all unimaginable ingredients, atleast for me. But i m enjoying the variety and the flavors with each dosa and the chutney. Today's recipe too is from a different ingredient, Watermelon rind. What is it? The white part, sandwiched between the tough green skin and the juicy pinky melon, is the rind. I have heard watermelon rind chutney, kootu, pickles too, but dosa, i was amazed. 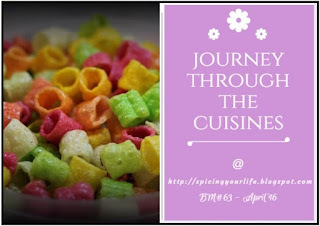 This happened with no big search, as i went thru some blogs with authentic kannada recipes, i got this gem. yet another No ferment, grind and pour addition to my dosa menu. This dosa has to be served hot, straight from the tava. So, not good for lunch boxes. 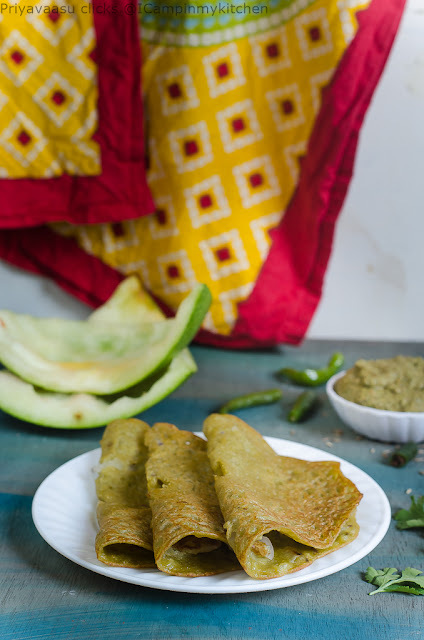 Serve it hot with a spicy chutney and enjoy an amazing breakfast. Wash and soak rice in water for 2-3 hours. After the soaking time, drain the water, take the rice along with watermelon rind, coconut, chilies, curry leaves and ginger. Grind it to a smooth batter. I used my mixer and ground the batter in batches. I didn't add any water to the batter while grinding, the watermelon rind has enough water to help in grinding. After grinding, remove the batter to a clean vessel. Let the batter sit for 15 minutes. Add chopped onion, salt, cumin seeds and ginger to the batter and give it a good stir. To make the dosa, heat a tava/pan, add a tsp of oil to the tava when it is hot, wipe it well with a tissue or a cloth. Pour a ladle of batter in the center, spread a little, but, not too thin. Dot the edges with gingely oil,make a hole in the center and add lil oil there too. Cover and cook for a minute. Flip the dosa, and cook the other side for another minute. 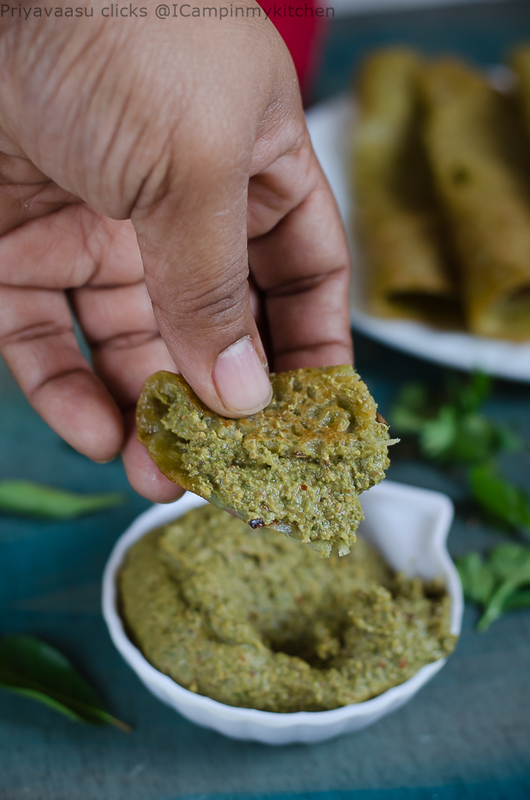 Wow, i have tried kootu and curries with this watermelon rinds but yet to try dosas with, now i know where to come if am plan to make this dosas. This is super awesome. Instead of thrashing, turning them into a dosa is simply superb. 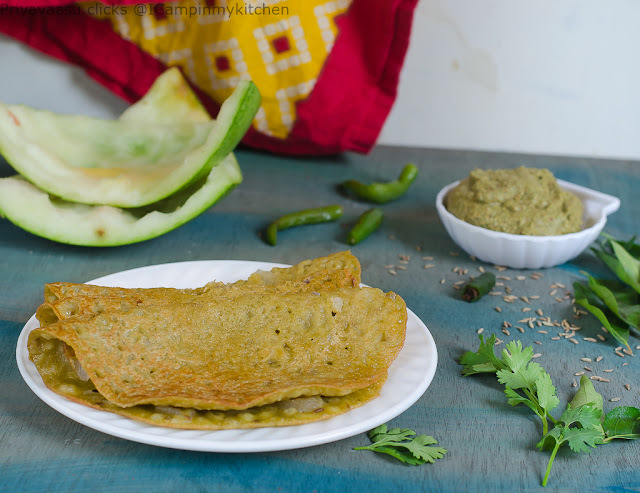 Seriously , you are coming up with all kinds of dosa and am having a virtual feast everyday. My mom used to make curry with this rind, but using it in dosa is quite unusual. You are really coming up with different varieties of dosas..
Beautiful combination Priya that's a real find..btw..have you hear of watermelon rind halwa?..yes I have it on the blog..heheheh..we are a crazy lot no doubt...however I love how you are able to find such wonderful combinations with the chutneys starting with the same letter..awesome girl! First of all I am amazed that you are coming up with combo dishes starting with the same letter. The chutneys are equally appealing as the dosas. Such a wonderful find from the letter K. I loved your version of the dosa. I have heard about this dish before, but now I know how to make it too! Wanted to try this because I made halwa and curry and sambar with this watermelon rind. As Valli said we crazy enough to try all this haa. What a array of dosas you are posting Priya fantastic. and the combinations are simply superb.. I am just amazed at how you are able to make combo dishes starting with the same letters. 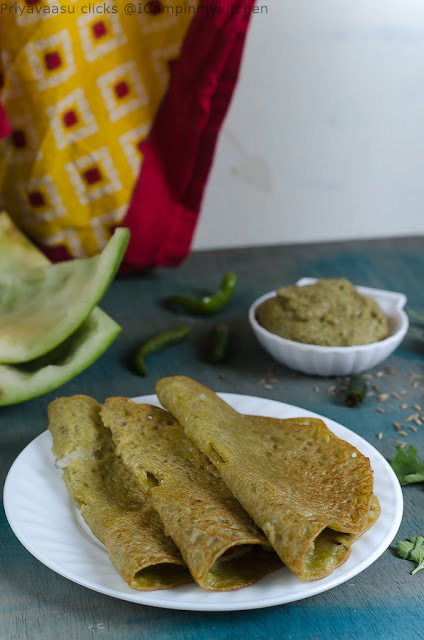 Lovely choice and I would have never thought about making dosai with watermelon rind. I like the theme of dosas that u have selected !! super brains ma ungalodudhu - main dish and pairing from the same alphabet ! !